Three highly distinctive figures using improvisation as a method and free jazz as a starting point, mingling electricity, percussion, and reeds into a cohesive stew, equal parts mayhem and calm. Wally Shoup is a Seattle institution, and this concert celebrates his 20th year in the city. He has dedicated himself to the art of free improvisation since the mid-1970’s. Informed by black free jazz and European free improvisation, noise, and punk, he incorporates his serpentine alto sax sound into myriad groups and combinations. In 1981, he released Scree-Run Waltz, one of the first American free improvisation documents. After working with Trans (Davey Williams and LaDonna Smith) in Birmingham, Alabama, he moved to Seattle in 1985 and became a central figure in the improvised music community. He has led numerous groups, including the Catabatics, Project W, Ghidra and the Wally Shoup Trio. He has also helped steer the Seattle Festival of Improvised Music to its current status as the longest-running festival of its kind in America. 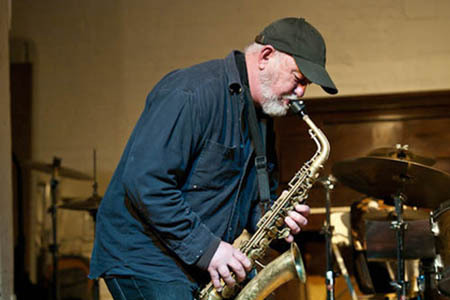 Shoup’s electric, adaptable sound, which merges Jimmy Lyons, Evan Parker, and Albert Ayler into a highly-charged, instantly recognized sound, was a natural for collaboration with Sonic Youth guitarist Thurston Moore. Their stage work has led to two CD’s: Hurricane Floyd (with drum iconoclast Toshi Makihara) and Live at Tonic (with Paul Flaherty and Chris Corsano). A mainstay of the Los Angeles free-jazz community for more than 20 years, Nels Cline has worked with dozens of the world’s most innovative artists. Beyond the jazz scene, he has collaborated with Sonic Youth guitarists Thurston Moore and Lee Ranaldo and country-punk-poets the Geraldine Fibbers, as well as appearing on recordings by artists as diverse as MC5 guitarist Wayne Kramer, the Blue Man Group, and new-age composer Osamu Kitajima. He also played key roles in two recent ’70s Miles Davis tribute projects: “Yo Miles!” and “Miles Remembered: The Silent Way Project.” One of Cline’s more daring endeavors was his interpretation of John Coltrane’s “Interstellar Space,” recorded live with drummer/vibe player Gregg Bendian in 1998. Aside from leading his own (instrumental) trio, The Nels Cline Singers, he is currently a member of Wilco. Greg Campbell incorporates world drumming and a jazz pulse, combining lightning chops and an architectural sense of form. A first-call drummer whenever expansive, non-classifiable improvisors come through Seattle, Campbell is also at work on his Ph.D. in ethnomusicology, writing a dissertation on an in-depth knowledge of Don Moye, the drummer with the Art Ensemble of Chicago.